Boston is a city of champions, so going to a sports game while you’re in the city is a must! Head to TD Garden to see the Boston Bruins in action (the Bruins are one of the most storied franchises in sport and part of NHL’s original six teams). While going to a hockey game is a classic Boston winter activity, while you’re at The Garden, be sure to check out the The Sports Museum, a hidden gem featuring more than half-mile of exhibits celebrating sports in Boston (and beyond). The Boston Public Market is an indoor, year-round marketplace featuring 35 New England artisans and food producers housed under one roof. Boston Public Market also features a community gathering place, The Kitchen, that hosts events, cooking classes, and workshops showcasing the bounty of New England farmers and artisans (the space also offers private events and cooking classes). The Public Open Night at the BU Observatory is a chance for people to come observe the night sky through telescopes and binoculars and learn some astronomy. The Open Nights are held most Wednesday evenings throughout the year and start promptly at 7:30pm during the fall and winter months. Just a short walk from the Hynes, L.A. Burdick Chocolate Shop and Café offers one of the best cups of gourmet hot chocolate in Boston, reminiscent of the intense, polished drinking chocolate served in European cafés! Or you can enjoy other specialty drinks and European-inspired pastries including Chocolate-Raspberry Cake, Nusstorte, Hazelnut-Orange Cake, and their signature chocolate Harvard Square. Who said rooftop bars are only for summer? 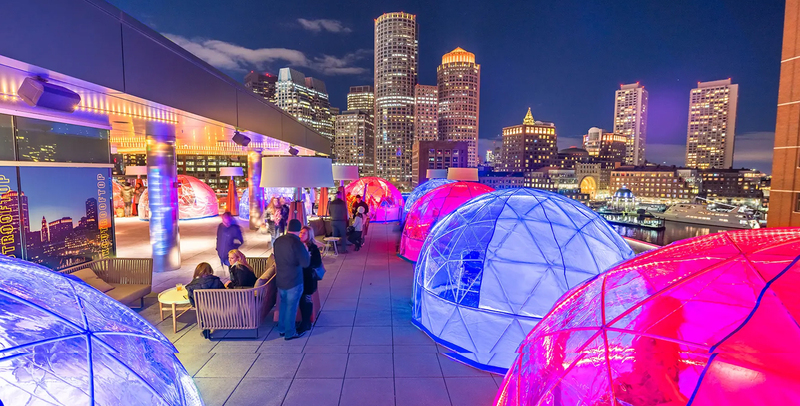 In the winter, The Envoy in the South Boston Waterfront (just 0.6 miles from the BCEC) puts out six heated igloos which are open for walk-ins or reservations Wednesday through Saturday from 4 to 11pm. Each igloo seats up to ten people and is equipped with fleece blankets to kick up the cozy factor. New interactive art installation in the Seaport? Yes, please! The Loop is comprised of six illuminated, moving cylinders which play music and animations. Take a seat in these giant circular structures, pump the handlebar, and watch a story unfold. Beautiful images inspired by fairy tales come to life in an animation that is visible from inside or outside The Loop. Every Thursday from January 24 to February 28, visitors can sip beer, Italian wine, and other cold-weather favorites, such as vin brulé (a warm mulled wine from Piemonte). The comforting food options are inspired by Italian Alps and include warm polenta, rustic house made sausage, and savory cheese and meat pairings. Step up your Instagram game at this cozy winter pop-up complete with fire pits, oversized flannel blankets and an artificial snow machine! The Lodge boasts a menu of delicious comfort foods like the Triple Diamond Slope Sliders or White Heat Fried Mac & Cheese — and piping hot cocktails like Hot Buttered Rum and Spiked Hot Chocolate to keep everyone comfortable. Historical interpreters, interactive exhibits, full-scale restored 18th Century sailing vessels, historic artifacts, and the award-winning multi-sensory documentary “Let It Begin Here” are just a taste of what you will experience during your visit to one of the highest rated museums in Boston (0.5 miles from the BCEC). Don’t leave without visiting Abigail’s Tea Room & Terrace where you can sample up to five different teas with a historic twist and a number of scrumptious treats. November through February, guests and visitors to the Liberty can play a round of curling on their iceless outdoor rink. After the game head to CLINK at Liberty to sample their special “après-curling” menu featuring plenty of hearty winter food options, as well as warm drinks like The Bonspiel, a New England hot mulled cider steeped with baking spices, or The Stone’s Throw, made with bourbon, sherry, vermouth, black walnut syrup, and Angostura bitters. For more things to do in the winter, check out Winter Activities in Boston & 10 Things to do in Boston This Winter for Under $25. Or check out our guide of What To Do for shopping, dining, arts & music, historic landmark, and sports & entertainment suggestions. To give you a better idea of Boston’s make-up, also check out our guide to all the neighborhoods of Boston.